What exactly is a pre-foreclosure home? Foreclosure happens when a homeowner misses his mortgage payment and the lender takes back his home. It follow that pre-foreclosure is the period right before the bank seizes control the property, right? Wrong. 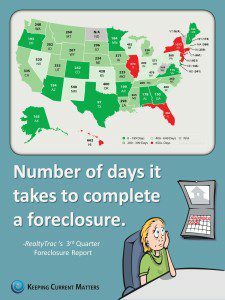 In legal terms, there is no such thing as a pre-foreclosure. Let’s take a look at this tricky concept and what it means for buyers in the market for an affordable new home. Anyone who is behind on their mortgage payment is at risk of losing their home to foreclosure. Homeowners who are seriously delinquent are at greater risk than homeowners who have missed only one or two payments. Nonetheless, all loans that are more than three payments overdue are recorded in the public records. An entire industry has sprung up of companies that compile lists of defaulted loans and sell them to investors looking to make a quick buck buying property for less than its market value. These companies coined the term “pre-foreclosure” to describe any home in mortgage default. A pre-foreclosure home can be a great deal for sellers…. In theory, a homeowner in mortgage default is motivated to sell the property before the bank takes it back and the homeowner loses control of the home. Buyers may be able to negotiate a hefty discount from the home’s true value if the seller is sufficiently motivated to sell. This is called a short sale. As foreclosure seriously damages a homeowner’s credit profile – and thus her ability to obtain a new mortgage – many pre-foreclosure sellers are happy to negotiate. Buyers can often purchase both foreclosures and pre-foreclosures for less than the property’s market value. However, foreclosure homes are risky business. Almost all foreclosure properties are sold “as-is,” and a buyer who does not undertake thorough due diligence risks buying a dud. A pre-closure, on the other hand, is a standard market sale. The buyer has an opportunity to inspect the property before he makes an offer. While pre-foreclosures seem a great deal on paper, nine times out of ten there is no deal to be had. In many cases, borrowers fall a month or two behind on their mortgage payment and then quickly catch up. Under pressure from the government, lenders are more willing to work with delinquent borrowers than they were just a few years ago, which explains why foreclosures are at all-time low in many parts of the country. In general, pre-foreclosures fall into two categories. Homes with 90-day late notices are usually resolved before foreclosure and hardly worth a buyer’s time. Pre-foreclosures with an auction date set are much more likely to sell before the foreclosure becomes official, but even then a sale is not guaranteed. With a pre-foreclosure, the seller has not actively taken steps to list the home for sale. The transaction is dependent upon the buyer identifying a homeowner in a mortgage default list and persuading him to sell. Many homeowners will be pursuing options to cure the default and will not negotiate. As such, it is better for most buyers to assume that a pre-foreclosure home is not for sale and seek viable alternatives with help from his real estate agent.